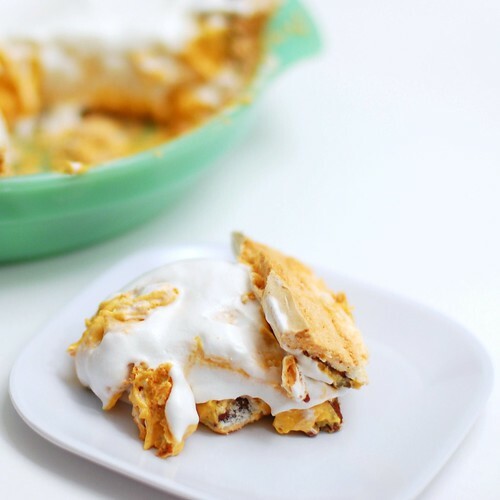 A pumpkin cream pie served in a pecan-studded meringue crust. That, right there, was supposed to be my masterpiece. This was going to be a winner recipe, and I imagined the food blog equivalent of everyone hoisting me on their shoulders and carrying me away to a raucous victory party where everyone brought something they made from a recipe on my blog and we all drank and hugged and had merry times until five the next morning. How very, very wrong was I. This mish-mash of ideas I found in various places come from individually neat ideas unto themselves, but plain silly when put together. For one thing, beginning to end, this stupid thing took me about seven hours. Seven freakin hours, can you believe that? On a weeknight, no less, so after getting home before five, I collapsed in bed around 1am (I know that’s more than seven hours, but I take a little while to wind down). 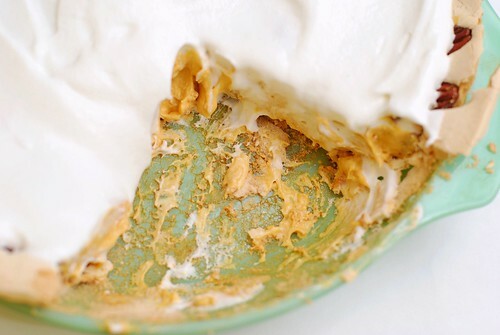 The meringue takes about 30-45 minutes to whip up, then bakes for an hour. 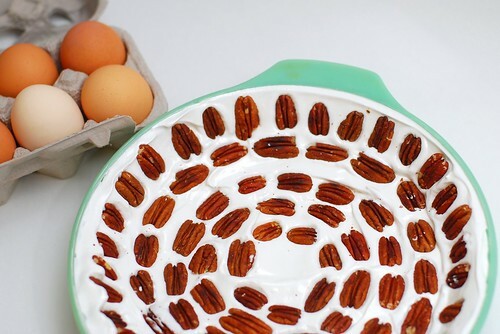 During which time there is nothing to fill the void, because we don’t want to do anything with the pudding mix so it won’t set anywhere but on that crust. The crust that bakes for an hour. Then cools for two hours. 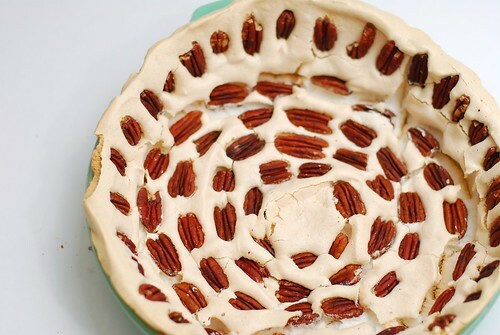 Making the filling is easy enough. Except that after you put it in said crust it needs to chill for an hour. 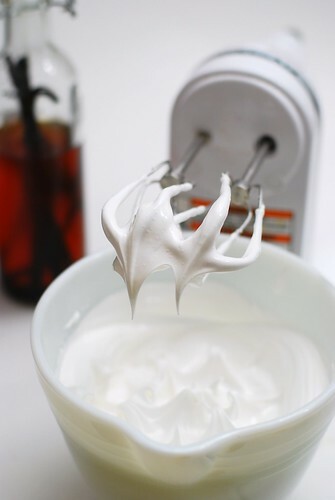 On top of all that, I put too much sugar in my first meringue, so add about 45 minutes before I realized that this potion was never going to get stiff peaks. Then, just at the end of the final cooling, I started a caramel sauce from the Joy, but of course, this was not the kind of sauce I meant it to be, so after burning my finger with sticky hot sugar, I tried another batch. And then added too much water at the end. We’ll only count the last half hour of that, since the first half was spent waiting. Then I cut into the pie to take a nice picture. Look at that friggin thing! What a mess! It is so pathetic that it looks like it’s hanging its head in shame, and it’s a slice of pie, how could it even do that? I don’t know, but it is. 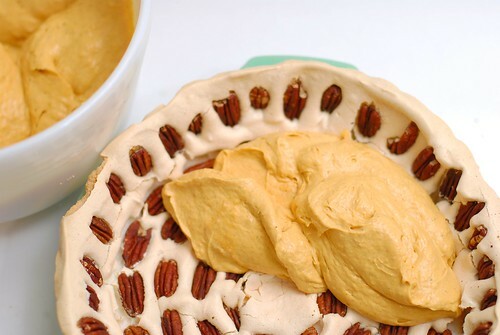 The meringue crust is not the worst idea in a world full of crusts made out of Crisco, but you can’t make this more than 24 hours before it needs to be done, or else all the moisture from the pie will turn it into a gummy mess. And I don’t know why it stuck so fervently to the bottom of the pie plate, I oiled that sucker and everything! The flavour combination was pretty great, though, and this idea may be salvageable. But right now . . . I’m too tired to salvage. I’m sure I’m not alone in this. What’s the biggest kitchen disappointment you’ve been on the receiving end of? Did you manage to salvage anything from it?